The name means “East West” and refers to the prevailing winds of southern Spain that greatly affect the aging of Sherry wines. ‘Este o este’ also loosely translates as ‘this or that’ in keeping with the Flip Flop/Double Back theme of change in the title. 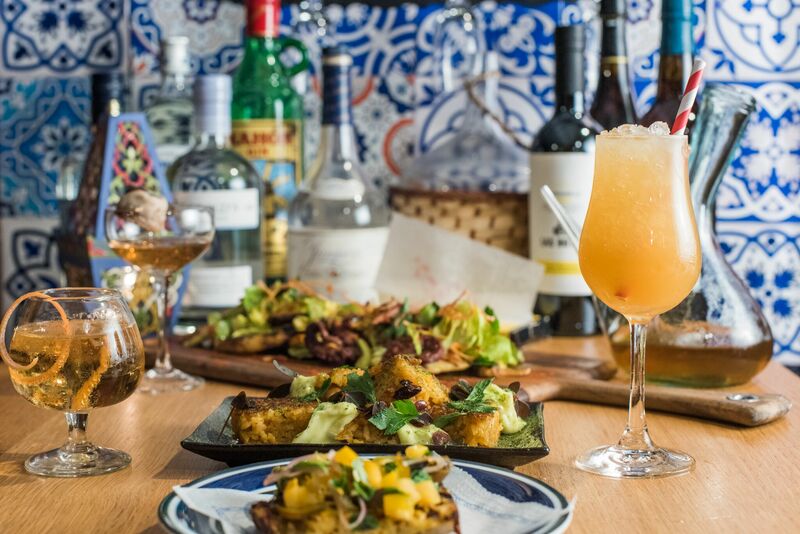 Sherry and gin will be the focus of the beverage program, but the real star of show is the food – which will be Spanish influenced. Chef Collin Hilton has done a beautiful job with this menu, which can be described as bright and coastal, rustic but clean. Spanish style dishes are close to his heart, and we cannot wait for folks to try everything he has created for this quarter. Décor will return to the light and airy vibes we saw with Flip Flop—but with a decidedly more Mediterranean look. Este Oeste’s sunny interior will feature soft pastel hues and a hanging collection of dried herbs, flowers, and botanicals. Blue and white Mediterranean tiles line the front steps of the entrance stairs and wrap the front bar to create the perfect backdrop for Chef Collin Hilton and Sous Chef Nick Salazar’s menu of deceptively simple, bright, Spanish-inspired fare.